Coats of this kind were worn one over the other by both Jews and Muslims. The monumental look indicated high social standing. 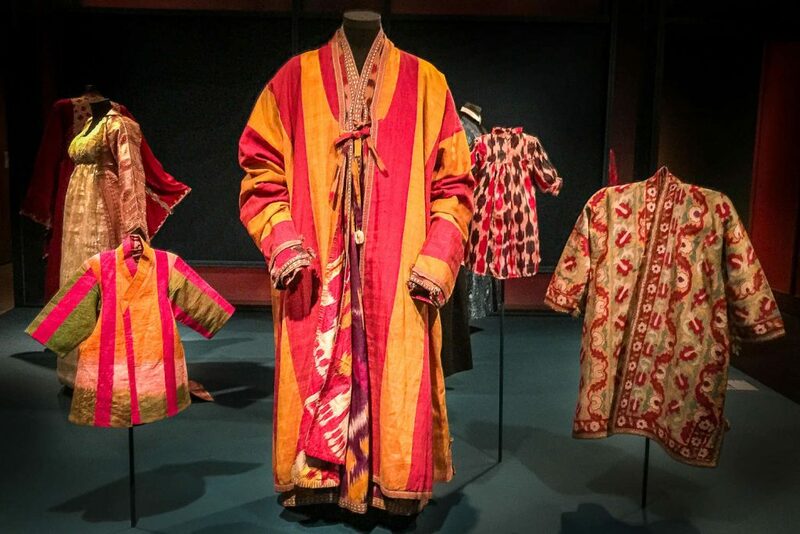 Central Asian Jews were dyers of ikat cloth, considered a lowly craft because it stained the hands and smelled foul. They were also traders in indigo, one of the colors typically used for such thread-dyed fabrics. Ikat is an intricate resist-dye technique in which threads are repeatedly bound and dyed before the are woven to produce patterns. The ‘Kaltachak’ is a collarless coat gathered below the arms, worn by both Jewish and Muslim women. This luxurious example is made of Russian brocade and local ikat (thread-dyed) fabric. 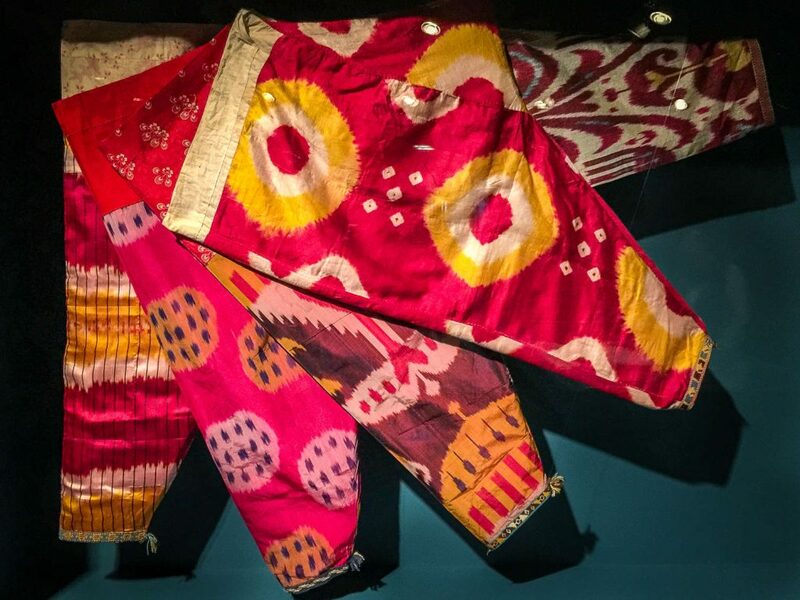 The combination of textiles reflects political and social changes in Bukhara following the Russian conquest of the region in 1868. Under Russian rule, Jews were able to emigrate to Ottoman Palestine. A Bukharan quarter was established in Jerusalem, and this ‘Kaltachak’ likely once belonged to a woman from one of its first families. 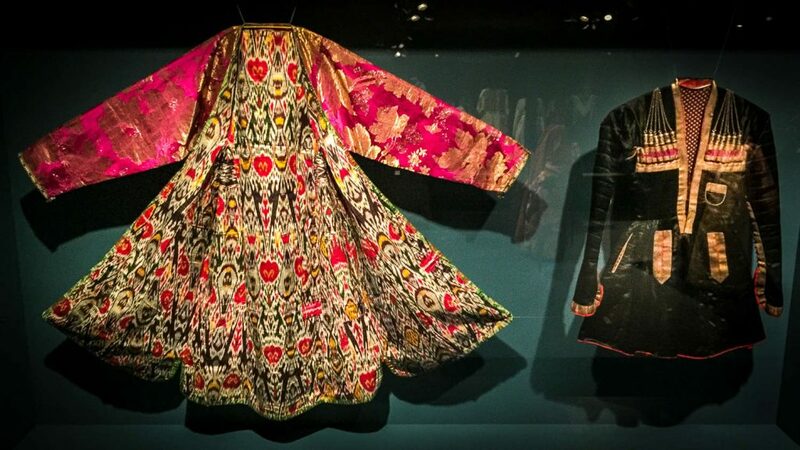 The ‘Man’s Coat’ on the right is part of the traditional costume worn on special occaisions by both Christian and Jewish men in Georgia. Defining its wearer as a warrior, the outfit also included a dagger hanging from a belt. Unusually in Central Asia, Georgian Jewish men were allowed to wear weapons. On the left, the diamond-shaped patterns adorning this Jewish groom’s outfit have protective powers. After a man’s wedding he would wear the suit on ceremonial occasions and holidays. In Zakho, Armenian weavers were renowned for the superior quality of their geometrically pattered goat-hair fabrics, while in other areas of Iraqi Kurdistan weaving was one of the main occupations among Jewish men and women. At right, white fabric with a narrow embroidered band characterizes Ethiopian dress of people of all faiths. The symmetrical geometric deisigns carry amuletic and symbolic significance, meant to guard sensitive areas of a woman’s body. The cross pattern (mesqel) above the hem at front resembles Christian crosses used by Ethiopian priests to bless believers and was a popular motif among both Jews and non-Jews. The Jews of Ethiopia had long been isolated from other Jewish communities, but came into contact with others in the early twentieth century. At that time they began to emphasize their religious identitty by adding new embroidered images such as the Star of David and the menorah to their garments. In Central Asia, trousers were generally considered women’s attire. 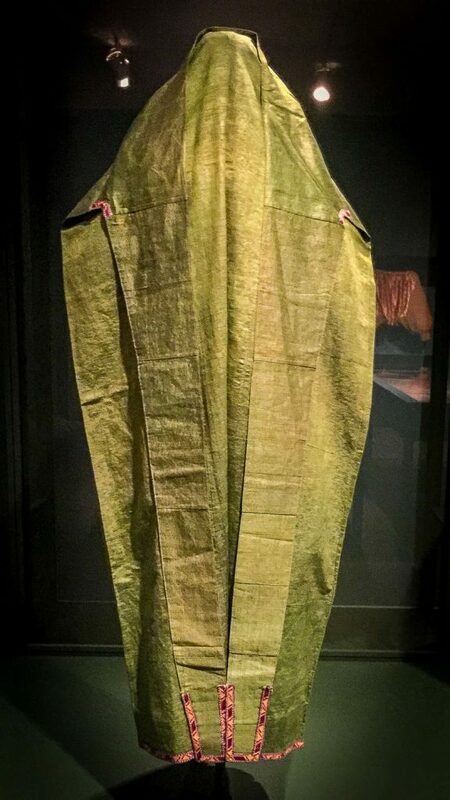 These baggy garments, similar to bloomers, were worn for reasons of modesty beneath a dress and extended slightly below its hem. They are often decorated with colorful details and specatacular partterns that were primarily enjoyed by the women themselves. The upper concealed portion was made from printed cotton fabric, while the lower exposed bit was made of shiny ikat-dyed silk. In the nineteenth and early twentieth centuries Alexandria, on the Mediterranean coast, was a bustling mercantile center and international hub, whose shops offered the best of European fashion. This dress combines a European cut with local fabrics and traditional silver-tinsel embroidery. No garments specific to the Jews of Mashad are known, since after 1839 they were ‘crypto-Jews’, forced to convert to Islam but practice Judaism in secret. However, the color combination of dark purple and green seen here is found in garments worn by Jewish women in Herat, Afghanistan, where some Mashadi crypto-Jews immigrated. 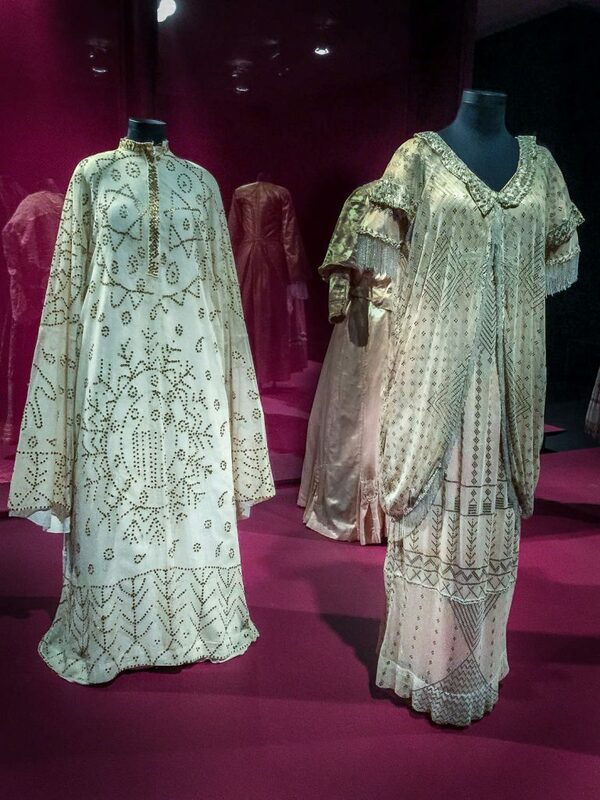 This type of costume, worn by both Muslim and Jewish women, reflects the early stages of westernization in Persia. 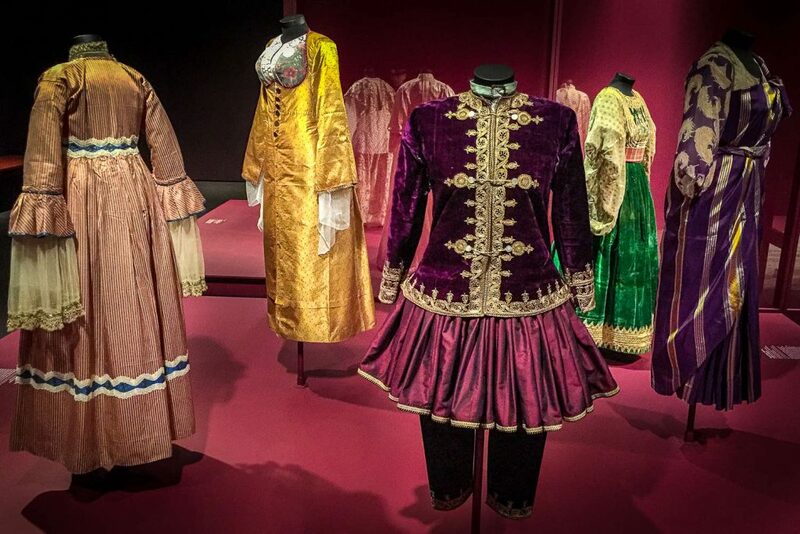 The fashion for the ‘shalita’, a skirt resembling a ballet tutu, was popularized by the Shah of Persia, Nasir al-Din, and his favorite wife, Anis a Dawla, after they visited Europe in 1873. 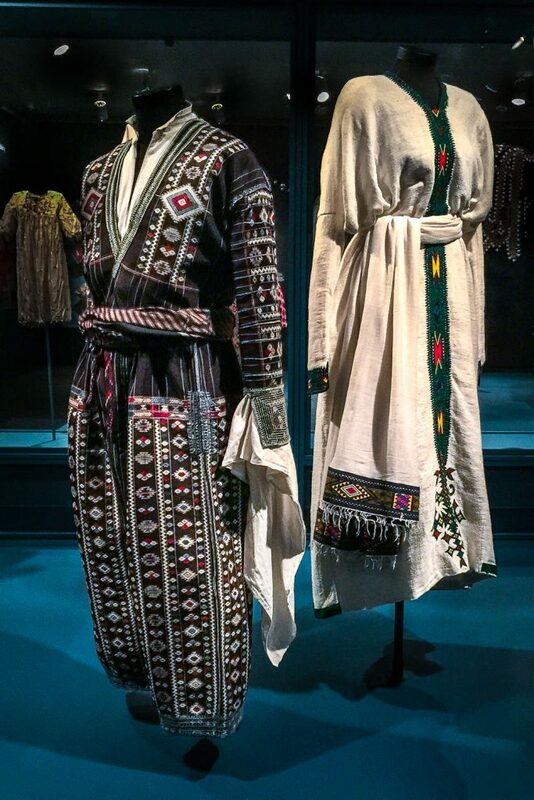 Mourning clothes, part of a Bukharan Jewish bride’s trousseau, were worn after the death of a close relative at the funeral and during the first year of mourning, as was the custom among local Muslims. The garments are marked by a gray, green, or blue color (bright hues such as red, pink and orange were rigorously avoided) and by the special cut of the outer dress, with two nonfunctional joined sleeves hanging on the back. indicating a sign of wealth. An article of outerwear, the ‘faranji’ was worn as a cape over the head, sometimes concealing the face.